I’ve been thinking if I should write this editorial or not. I eventually decided to write it and as a proof, you can read it. I have been impressed by the event I am about to share with you.When we organized the action MAKE A CHILD SMILE, we especially wanted to offer those children an authentic day camp where they can disconnect from their daily life, break free and enjoy the time spent together. And it was just like that for the kids.What was strange and surprising for us, was the attitude and the reaction of the parents who came with them. They were very young, some had barely reached 18 years old. When I spoke to them about David and Goliath, they listened carefully to the story. At the end of the story, we had a practical activity with the children. We made a sling and stones from paper to target Goliath. We were surprised to see the parents making slings and stones from paper, in competition with the children. I first thought they were helping their children. When we were about to start the contest, I realized how much truth there was in the words of Ileana Vulpescu, a Romanian writer: “The mind and the soul of man do not always go along the same path.” I then noticed that the parents started to compete against the children in using the sling. They forgot that they only came to accompany the children and they released the ”inner child”. There was a fierce battle between 25 children and around 8 parents. Finally, three children and two parents won the contest. The parents were beaming with joy. Looking at this, I could tell that these parents have skipped several stages of childhood and suddenly discovered the universe they lost. Then I thought maybe they loved the story of David’s life so much that they wanted to prove that they could also defeat Goliath. I do not know how much they understood from the biblical message of this story, but I saw how much they wanted to win the medal, even to the detriment of their children. I must admit that I realized then that there are times that parents need to let loose and turn into children for a moment. We created this project to celebrate Children’s Day. 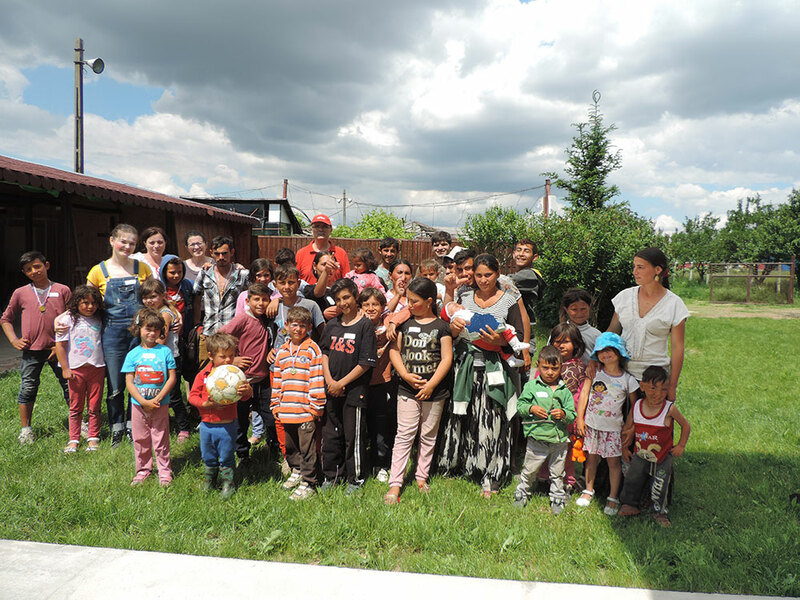 We organized a special day for 25 Rroma / Gypsy children from a village a few kilometers away from Charis Foundation. The children were accompanied by some parents. We played together table tennis, Dutch Shuffleboard, and foosball. I have prepared for them an interesting lesson about David and Goliath, at the end of which we had a practical activity and a prize competition. We socialized with them, ate with them, and organized some prize-winning games. At the end of the meeting, each child received a gift pack with sweets, food, toys, stationery, and many other items useful for them. Check out our album below. We were glad to visit and interact with some of the elderly people living at the DUMBRAVA-TINCA shelter. We brought them a large quantity of bananas and food for breakfast. We had the opportunity to talk to some of the people there and got to meet a missionary group from Portland, USA. Our presence and constant support are an encouragement both for them and for us. Lately, we have had a lot of practical activities at Charis Center. I will only mention a few, the most important ones, especially those having to do with the vegetable and animal farm, which provide a part of the goods we need in our projects and programs. We focused on fruits and vegetables, consisting of maintenance work and applying treatments. Daily, we took care of the animal farm where we have goats and chickens. This was also the period when we prepared the fodder for winter, for the goats. We have also taken care of the five hives of bees. Moreover, we began the work of restoration of the vegetable greenhouse. We did a series of repairs to the water system, which was badly affected by the low temperatures earlier this year. Also, we upgraded and repainted a few rooms on the first floor of Centre Charis. Through this program, we hosted 4 large groups for a weekend in Charis. Two of the groups were made of school children and parents, along with teachers from a Christian school. The other two were groups from churches that came with their leaders and families. They played together, they socialized, they ate, using to the full the facilities of Charis Center. We were glad that we could offer our facilities to the groups that want to relax in our Center. See pictures here: https://www.facebook.com/media/set/?set=oa.886560198157875&type=1 and https://www.facebook.com/media/set/?set=oa.918400401640521&type=1. We started to collaborate and support a small Rroma community from a village close to Charis after getting to know an old man called Rostaș and his family. Pray that God will bless and protect this collaboration and service for this community. This summer, through the program 2 Cultures 1 God we will host for 10 days, a group from Switzerland, from Youth with a Mission. Pray that God will bless this collaboration on the long term. The work that we do is possible due to the daily involvement of our three employees: Dani, Mona, and Daniel. Pray that God will protect them, give them power, and provide for their salaries. Every month we need 1650 Euros for salaries and the corresponding taxes. This year, we have 550 Euros secured per month; the rest of 1100 euros, will come by faith. We still need 1100 euros monthly in order to be able to pay the employees.